I’m not writing this post to brag about what a wonderful kid I have, I’m writing this post to share how we were able to get to this point. The point of having “enough” and being rich even though we live a modest life. Community service has been a part of my children’s lives since they were small. We have caroled at nursing homes, collected food for both people and pets, made meals, and served meals to the homeless. The list goes on and on. It was never to have a paper signed to confirm that they were serving the community. It has been from a place of actively participating in our community. Raising a child that gives back comes from you. You are their first teacher and children learn best by example and hands on experience. My son needed some community service hours last year as did his friends. I was surprised at the response by a few of the parents. Some shared ideas on, “how to get this over with quickly” and others eye rolled as this was to be added to the list of things to do around school and sports. How does this teach children the responsibility of service? How does this thought process grow empathy and compassion? It doesn’t. While collecting food and putting it in a box to be shipped off somewhere in your community is noble, there is a disconnect. Who hasn’t been guilty of clearing their cabinets of unwanted items in the name of charity? Now take those items to the food pantry while it is open, your feelings might change. 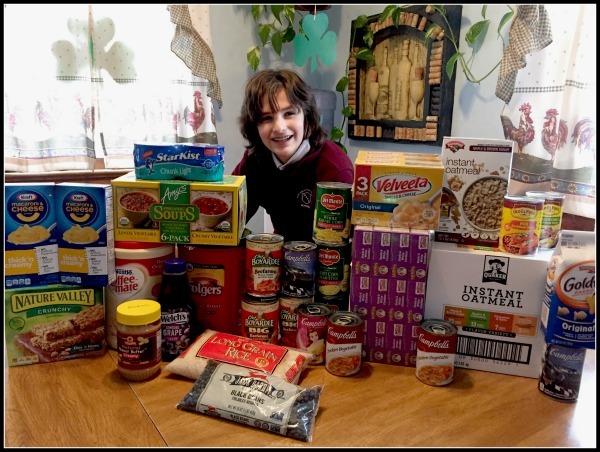 My son collected 3 boxes filled with food and $131 dollars for the local food pantry. While he was proud of himself for his accomplishment, nothing prepared him for what he would feel when he delivered those items. When I called the pantry about his donation they insisted that he bring it himself when the pantry is open. He received hugs, handshakes, and much praise. When we left he said, “Wow, I feel so good. I didn’t know I could feel that good. Can we help out there when school is over?” I was almost in tears. He has a good heart. A friend of mine that volunteers on a regular basis with her daughter shared some thoughts with me about community service. We can’t expect children to automatically feel grateful if they haven’t seen the alternative. Life can change in an instant with the loss of a job or a loved one. Once after working at the soup kitchen my boys saw a person they fed out on the street pushing a shopping cart with all their belongings in it. I think that was a huge moment for them. A lesson that can’t be learned, but lived. Seeing. Doing. That is how we learn to give freely. Hopefully along the way we inspire someone else to give, someone else to help out. What a great lesson to teach and learn! I love the advice you gave your boys about helping others. What a beautiful lesson learned. I don’t kids can really understand how lucky and how fortunate they are until they see what others don’t’ have. My son has a friend whose parent is not very involved and the boy struggles to just survive. My son sees this and helps as much as he can and I love when he hugs me and says thanks mom for being there. It truly is a beautiful thing to see you kid realize how fortunate they are to be loved and have enough. I agree about what Community service teaches us and our children. Helping and giving to others makes them realize what they have and why they need to be thankful. I’m so happy to hear that you are teaching your children to be happy having what they need and not obsessing over gathering material possessions. That will really serve them later in life. I’m also happy to see you doing service work with them, as it’s so important to help others. Community service is the backbone to our society. I wish it was more mandatory. It’s food for the soul. I think that it is important to involve youths in community service because it does truly help us appreciate what we have. Sometimes it is really important to be able to gain perspective. I think it was a great lesson to learn! Not sure I have seen many kids around me to community service but some would have really needed to give back some time to society! I love to hear about others doing community service! Its something they are very good at promoting in our local schools, my eldest is taking part this year. What a beautiful post. Voluntary/community work is SO good. Serving others can be healing for the person being helped and the one helping. You learn skills that cannot be taught in school! what a great and educative article, on services to the community,i have share in your experience and come to know that life is more about what you give and not what you take. what a great and educative article, on teachings of services to the community,i have share in your experience and come to know that life is more about what you give and not what you take. Community service is important especially when the kids are involved. It teaches them compassion and kindness and it makes them realize how lucky they are in life that they have enough to help out those in need. I think it’s wonderful that you encourage your kids to help out! My children love to do volunteer work. Usually it is events organized by the parish we belong to. Sometimes it is a school activity where they help a medical mission or a feeding program. My heart feels like it is going to burst from gratitude that my children show compassion to others who are in dire straits. I am truly blessed. This is an awesome thing to do. Sounds like you have a great family. It has definitely inspired me to do something similar! I love this post! I am a strong believer in community service and have been involved in volunteering to help others all of my life. It is wonderful to experience giving back through our children’s eyes. Great message here. It is important to teach our children from a young age how to give back to the society. I totally agree with you that community service teaches a lot to kids that can’t be taught through books! It also makes them strong and they are ready to tackle any challenges! Teaching kids to do community services will be very helpful for their growth and molding them to a wonderful person. Plus, it is a good way to get to know good friends for them. I love this, it is great way to teach our children the importance of helping others and an act of kindness goes a long way. Well done lady. That’s so great that your son was able to see that he had enough and didn’t need more things just to make him happy. He was interested in looking out for the needs of others, which is a pretty great thing indeed. I really find this is awesome, and yes, you can brag about your kid! It’s fantastic that in such a consumption-oriented society as in the US he is so aware of how privileged he is; there are people with no roof and no food, after all. When I’m at home, I tend to complain that I don’t make much money and do feel sort of ‘poor’, but I travel a lot and do see how other people live – and then I feel ashamed of not being grateful for what I’ve got, that I never had to worry about feeding my child or taking it to a doctor or things like that that other people have to struggle with. What a great post and a wonderful lesson! The high school my kids go to requires 40 hours of community service for students to graduate. I think it’s a fabulous idea as it teachers them that they most certainly have enough and that it makes you feel good to give. Very nice! I love these stories about teaching kids. These are beautiful examples of how guiding and teaching kids should be so that they will grow up to become beautiful adults. What a beautiful story and a powerful lesson for all of us. Thank you for this inspirational post, Milena. I am always amazed at the natural empathy and generosity that children possess. It is so important to nurture that behavior through service! I am truly humbled by your son’s journey. I hope we can all learn from his experience.